The World Cup has gotten me thinking about the impact of life as an Expat. More importantly how strongly it impacts our identity and our being to adapt to a new culture, and then dare to return to the one you started in. You may have just thought, “Oh, you mean Repatriating!” Actually, I mean something I don’t have a word for – I repatriated to New York years ago, from France. However, even years and years later, I am profoundly affected and changed in ways that still amaze me now. I am fortunate to visit France almost every year, for many years now. I am born American, but I wonder why it is that hearing the French national anthem before France’s game makes me feel so emotional. I enter a bar, alone, but because I am wearing a French jersey, I get approving nods from the French people in the bar. 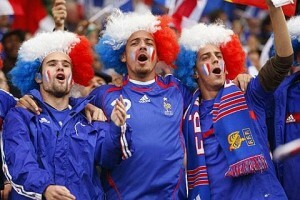 I feel overjoyed that when I am excited that the French may score a goal, the entire bar is, too. A loud chorus of “Allez les bleus, allez les bleus!” echoes from every corner of the bar, and I am swept away in the words, and the melody. Before long, an Italian/French guy is talking to me and asking for my number. Vive la France! When I leave the bar, I feel like I’ve left France, and once again, I am alone in the dirty streets of a city I know too well, but don’t feel completely connected to. Beyond expatriation, and repatriation, is the feeling of being split at a core level. It’s like having two homes, two sets of values, two ways of existing, and two hearts. I experience life on multiple levels, taking in behaviors, exchanges, and conversations from different perspectives. 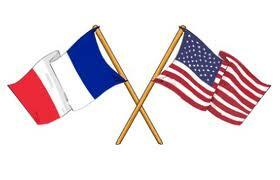 I truly feel part American, and part French. The beauty of this is being open to so many adventures and opportunities that language and cultural understanding provide. I feel blessed that I can enter a bar alone, and yet feel completely accepted and surrounded by friends in a short time. The challenge is that being “home” I always feel like I’m not quite. A part of me is always looking for the rest of me, to be found in the company of Petanque, French friends, French food, etc. You’re normal! Adapting to a new culture, and learning a new language changes us. It is neither good nor bad, it just is, so accept that these feelings of not quite fitting in at “home” is going t happen periodically. Seek out the culture you crave. Wherever you live, try to find a social group, a bar, an organization, whatever you can, where people of the culture you identify with come together. Go to meetings and events and make friends so you can stay connected with that culture and language for years to come. Consider an Expat Coach! Sometimes you just need to talk about the emotions that accompany the process of cultural cravings, as I am calling it. Expat Coaches have been there! (And probably still are!) It’s nice to know you won’t be diagnosed as a split personality, but, instead, receive compassion and understanding. This entry was posted in Changes and Transitions, Culture, Expat Focused and tagged adapting to a new culture, expat, homesick, living abroad, living overseas, missing home, repat, repatriation. Bookmark the permalink. Post a comment or leave a trackback: Trackback URL.